This is a purely military Order, founded by the Empress Maria Theresa in 1757, in acknowledgment of the valour, wisdom, and loyalty displayed by her officers in the memorable contests of her reign. Her Royal Consort, the Emperor Francis I, took upon himself the office of first Grand Master; and that high dignity is fixed by the statutes (published 1758) to belong to the sovereigns of Austria for ever after. The claims to the Order rest chiefly on personal military merit, irrespective of birth, duty, favour, family connection, or long service. The number of members is unlimited ; but it hardly amounts, at the present moment, to a hundred. All superior officers (including ensigns and cornets), indiscriminately, and without regard to religion, rank, or other circumstances, are eligible for the Order. Originally, there existed only two classes : Knights of the Grand Cross, and simple Knights ; but the Emperor Joseph II added (1765) a third class-that of Commanders. The badge of the Order (Nos. 3 and 4) is an octagonal cross, enamelled white, and set in gold. The centre, also in gold, contains the Austrian Arms, surrounded by a white margin, in which is inscribed the word : "Fortitudini" (For valour), in golden letters. The reverse shows, on white ground, the initials, in monogram, "M. T. F." (Maria Theresa [and] Francis), encompassed by a golden ring and laurel wreath. The ribbon has the colours of the Austrian Arms, and is divided into three stripes—the middle being white, and the two extremes poppy-colour. 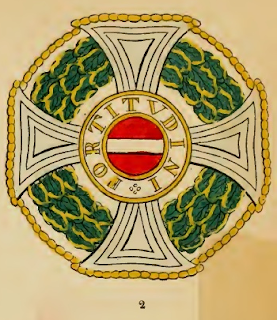 The Knights of the Grand Cross wear the insignia on a broad ribbon of the same colour, across the right shoulder towards the left hip, while the left side of the breast is adorned with a star, the face of which represents the Order, embroidered in silver, resting on a laurel wreath (No. 2). This star was added by the Emperor Joseph II in 1765. The Commanders wear the decoration round the neck, on a somewhat smaller ribbon, and without the addition of the star ; while the simple Knights suspend it from the button-hole by a ribbon about an inch and a half wide. The Order is held in high estimation, on account of the rareness of its distribution. It is, according to the injunctions of the founder, reserved for extraordinary exploits of military success and skill.